Minimally Invasive Esophagectomy in a Patient with Portal Hypertension. Minimally invasive esophagectomy in a patient with portal hypertension. Scott J. Keckler MD, Colleen S. Hupp DO, Amit K. Taggar MD, Mazin F. Al-kasspooles MD, Niazy M. Selim MD, MBChB, PhD. University of Kansas Medical Center, Department of Surgery. Kansas City, KS USA. Introduction: Open surgical resection for esophageal cancer has a high morbidity. As minimally invasive surgery has evolved, its application for esophageal resection has become more common. The presence of portal hypertension carries an increased risk for bleeding, and this risk may limit the use of minimally invasive surgical techniques. We present a patient with cirrhosis, portal hypertension, and esophageal adencocarcinoma who underwent a minimally invasive esophagectomy. Methods: A 63 year old male with a history of cirrhosis and portal hypertension secondary to hepatitis C underwent endoscopy for esophageal varices. A mass was seen 2 cm proximal to the gastroesophageal junction. Biopsy was positive for adenocarcinoma, endoscopic ultrasound confirmed a T2 N0 MX mass. Two days prior to surgery a transjugular intrahepatic portosystemic shunt (TIPS) was placed. Central venous pressure was 16mm Hg at the time of TIPS. The central venous pressure prior to surgery was 10 mm Hg. Upon entering the abdominal cavity diffuse varices were seen, however the decrease in portal pressure allowed for a combined laparoscopic and thoracoscopic esophagogastrectomy to be performed without any bleeding complications. 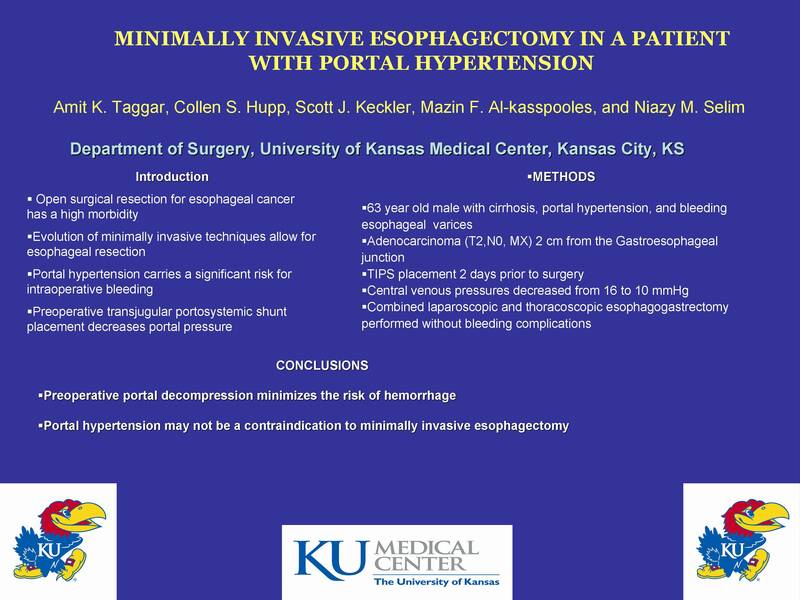 Conclusions: Preoperative portal decompression minimizes the risk of hemorrhage and allows for safe and successful minimally invasive esophageal surgery.